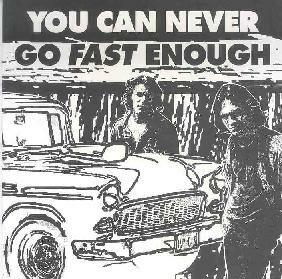 Various Artists - "You Can Never Go Fast Enough"
Remember the cult movie Two Lane Blacktop by Monte Hellman? Well, you are not the only one. I never saw the movie but someone (Filippo Salvadori) was inspired enough to get together obscure and well known artists (Calexico, Giant Sand, Sonic Youth, Wilco, Roy Montgomery, Leadbelly, Charalambides) to contribute tracks to this CD. Some tracks are exclusive to this CD, while others are licensed. The majority of the tracks are acoustic but there are a few heavy moments like "What the Girl didn’t Say" by Mark Eitzel and Marc Capelle, "Vanishing Point" by Giant Sand, and "Flying Machine" by Charalambides. I really loved "Stewball" by Leadbelly. The Sonic Youth track is really a soundscape rather than a song. The version of "Satisfaction" by Cat Power is really cool and super slow. Roy Montgomery closes the CD with a 12½ minute song called "2LB". It is quite a heavy spaced out song. This release also exists as a 2-LP gatefold. A very interesting compilation CD. I guess I should try to see the movie! Plain Recordings is distrubted through RUNT. You can visit their web site at: http://www.buyrunt.com.